Push the light with receding darks. Set-up a special table or shelf, big or roomy near a window-sill. Then play with light. Try natural light or spotlighted effects within a coloured box on a table. Make your colours brilliant by setting off your colours with a soft background of cool light colours against warm flowers and warm green under cool leaves. Keep the background in pale colours. Use a multiplicity of colours with each set: from yellow-orange to burnt sienna; from mauve and permanent rose to the palest pink. Flowers viewed from the rear can be interesting as those viewed from the front. Arrange the cool colours around the warm and contrasting colours around the whites. Pack colour around the white flowers. Note the soft edge on left-hand side, and the hard edge on the right. Note there's no detail where the white is bright. Observe the green leaves. Green leaves are not all green as you think at first. How many greens can you see here? Blues, moving into purples to ochres and olive. Now, do the reflection marks and add deeper cooler colours. The background mixture was a Cobalt blue and light red painted up to the flowers. This was allowed to dry. Then the flowers and stems were done in a straight forward manner and left to dry. This resulted in a bright hard edged painting. I started from the top, the mixture was washed with a large brush right across the entire watercolour, except for the white areas, which were painted around. As the last wash was applied, it was scrubbed lightly in several places to dislodge the previously painted pigment, so it would run down into the new background in a soft-edged manner. Next, I painted the panel of deep purple, mauve, alizarin crimson and a bit of burnt amber to improve the quality of the painting. Watercolour is the ideal medium for portraying the magnificent shapes and colours of flowers. With water colours you can create subtle diffusions of colour that capture intangible effects. Spontaneous brush-strikes and lost and found edges gives a sense of natural living forms. 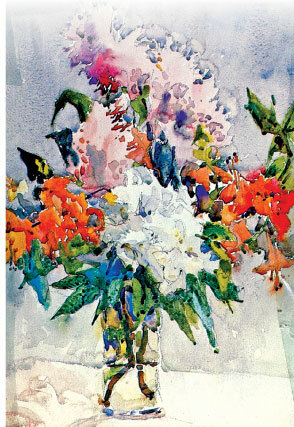 The painting done here is a bouquet of flowers in a crystal vase and was an appealing challenge. This was done on 140 lb hot-pressed drawing paper with a slight grain. To paint the back ground, I have used Sable hair soft brush to get an even flow, while for stems and finishing touches No. 3 and No. 2 Sable hair soft brush. Explore your ability to paint and practise working quickly, with minimum error. You gain practical experience designed to increase your creativity as you may recall it is a joy of watercolour.